The palatal expander "expands" (or widens) your upper jaw by putting gentle pressure on your upper molars each time an adjustment is made. 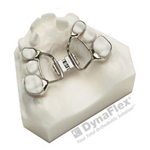 The animation below will instruct you about your expander. Follow specifically the instructions given to you by Dr. Johnson.